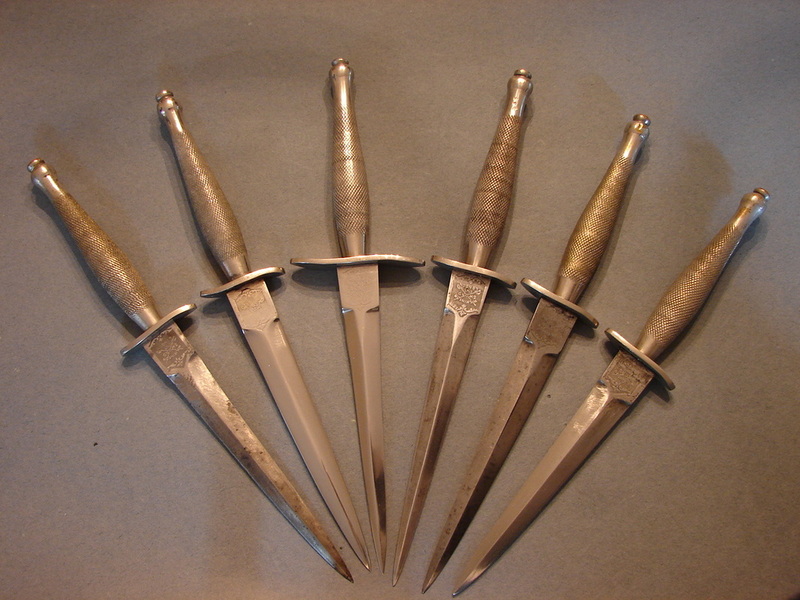 Wilkinson Sword Below: Three First Pattern knives with different length guards. From left to right we have; a three inch, a two and a half inch, and the more common two inch guard. Not that any First Pattern are "common," but the longer guards are more rare. The center one originally had a three inch guard but someone cut it down at some point by a half inch. The ends of the guard still show rough file marks from the cropping process. Note also that the guard has been installed in the opposite direction, based on the sweep of the guard. Was this done accidentally on the initial build, or later by removing the guard to shorten it? This knife raises a lot of questions and like so many others offers us no answers. Below: Does this qualify as a First Pattern? The blade is of that style but obviously the "Tulwar" shaped handle is not. I assign an Indian origin to this knife but the quality is much higher than many WW-II knives from that region. I have several other knives probably from that theater of similar quality so there were shops and craftsmen up to the task. I have at least one other knife with this same form of "knurling" which produces "waves" not checkers. 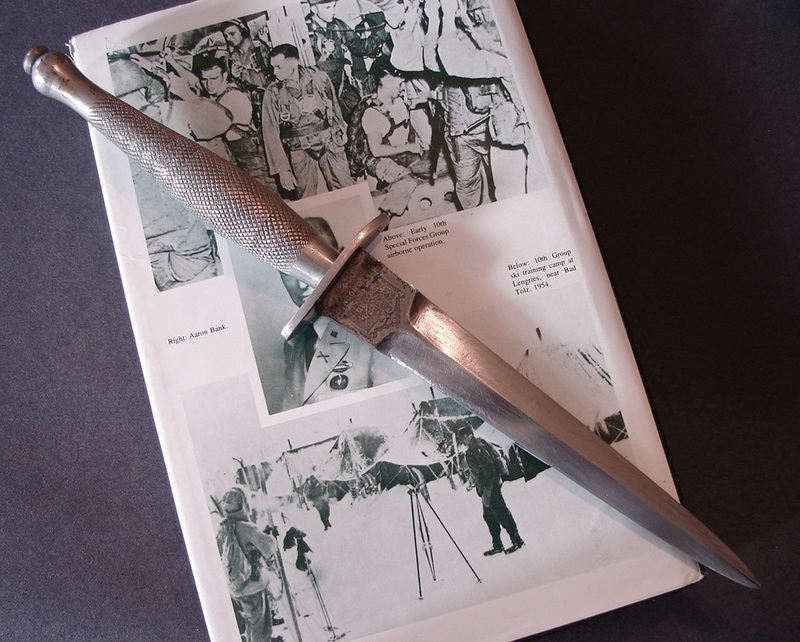 That knife was carried by an OSS Agent in the CBI China/Burma/India theater. The slight discoloration on the ricasso is actually where someone used a die grinder to remove metal along with any identifying marks. Why or what they removed I do not know. 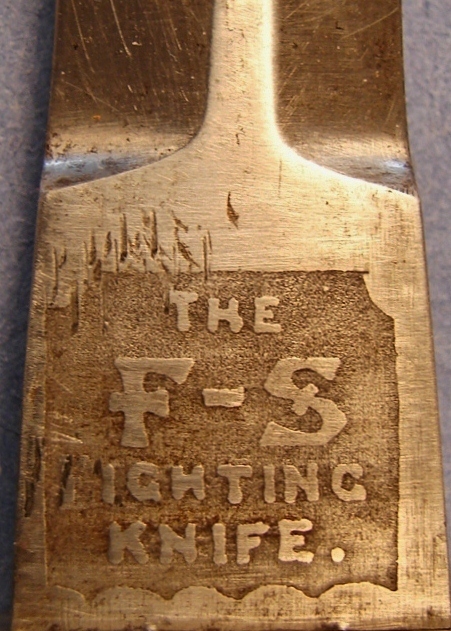 A traditional looking sheath is marked "D^D" for the Australian Dept of Defense on the frog. The bronze handle with a true top nut finished with a German silver guard (stamped GUP) makes for a stunning knife. (Many lower grade India-made knives have their handles soldered on.) The smaller knife is equally as rare and has a faded, once black, cord wrapped handle. The sheath is missing from the small knife. 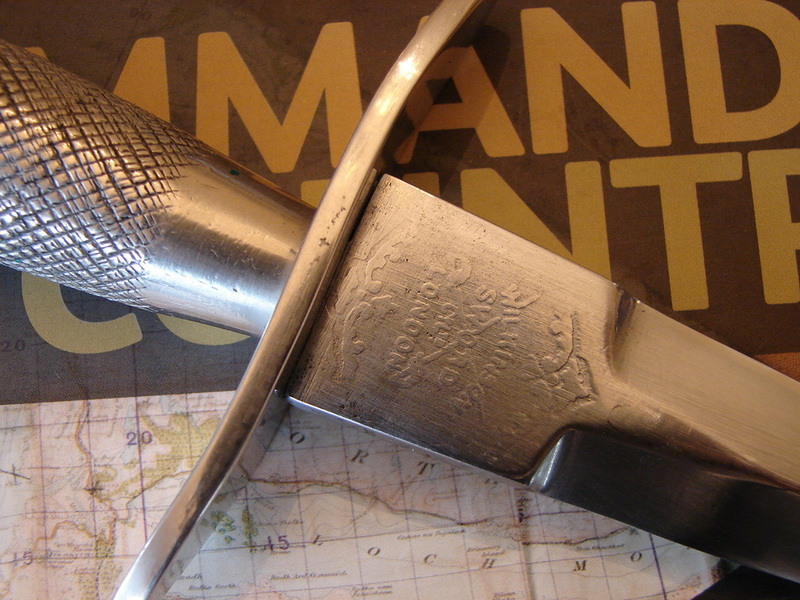 A large "V" like those found on the French Mini-Agents' daggers is clearly stamped into the handle near the blade. These two knives were also donated by good friend! 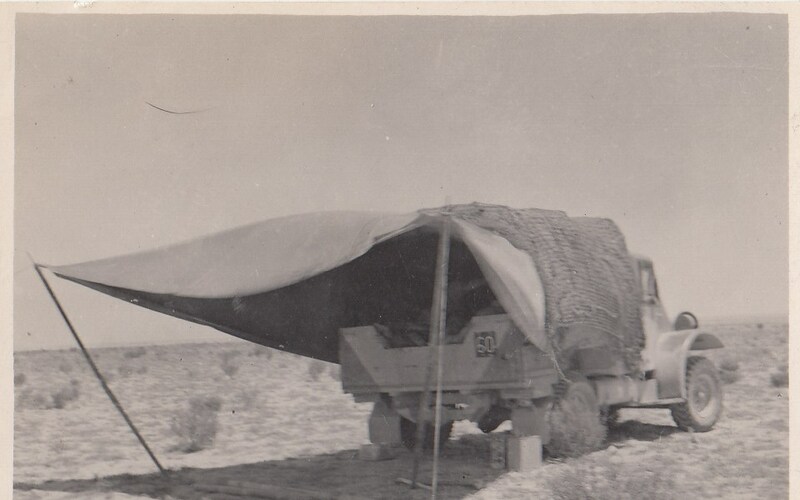 Below: SAS First Pattern: This First Pattern belonged to a British Commando who served in Africa in the 8th Army LRDG (Long Range Desert Group). Unfortunately the man i bought it from could no longer remember the veteran's name. The medals are for service from 1939-1945 Star, Africa Star and Italy Star, as well as Defense Medals. I paired the well-worn knife up with this rare period sheath. The knife is a Wilkinson although there is very little left of the etchings on the ricasso. They may have been purposely polished off. The blade was blued and has turned brown over the years. The top nut and end of the tang has been twisted off at some time and the shortened pommel peened tight against the tang to hold the handle in place. I suspect the original owner was trying to tighten down on the nut to keep the guard from wiggling and over-did it! The damage was done a long time ago. The last 1/8th of an inch is also missing off the tip of the blade. This knife has not had an easy life. So we have added another tired, but still combat worthy, Fairbairn-Sykes to our collection. Based on the soldier's medals, it is one which deserved a good home. 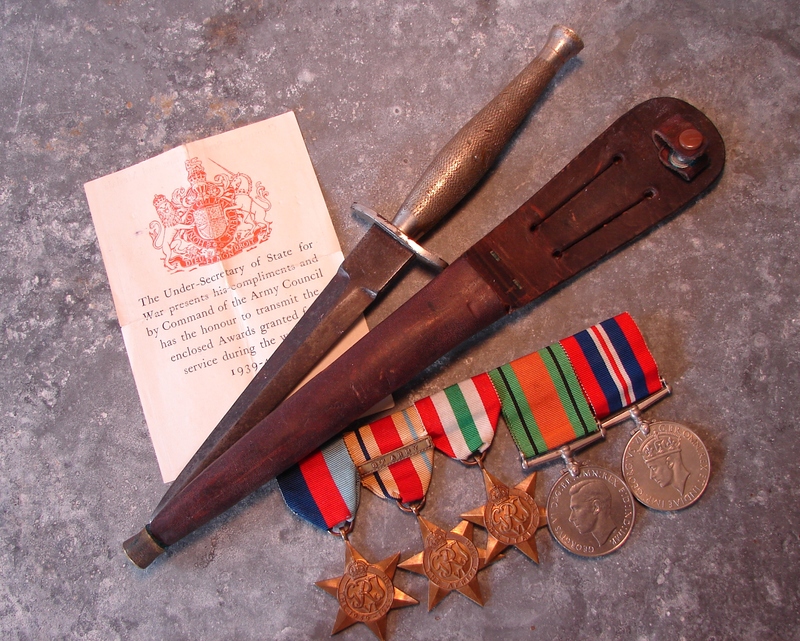 Below: Here are some photos that accompanied the weary SAS First Pattern dagger. I wish I had names to go with the faces. Below: SAS Patch, also from this grouping. 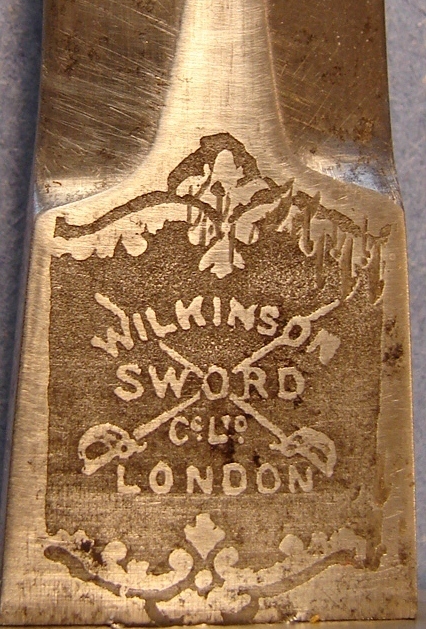 Below: Made by Wilkinson Sword Co. London. It is etched with the traditional logos on the tiny ricasso. Here is a knife I searched for a long time to find. Unfortunately I have no story or provenance to go along with it. Perhaps someone will eventually come forward with that. 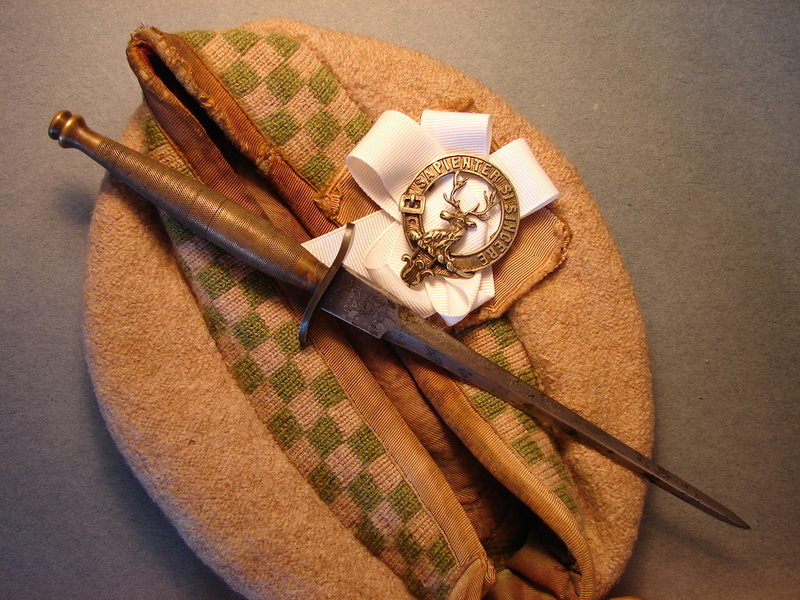 It is similar to what I refer to as the Lovat Dagger but a bit larger. The blade is approximately seven inches long. The entire knife is about a 7/8ths scale. The handle is finely knurled brass. 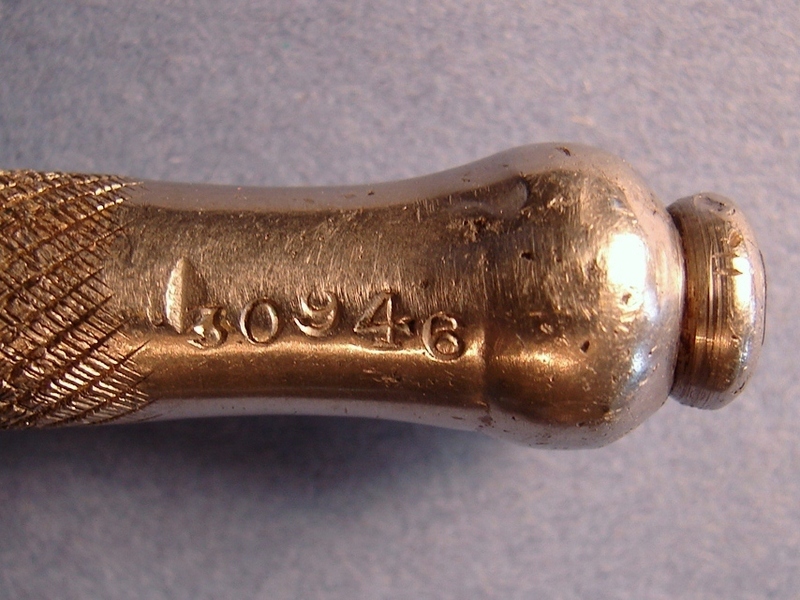 Note the different pommel shape compared to a standard First Pattern. Was this an alternative design that never went into production or a one-off commissioned by someone with influence? Whatever the story it makes for a fascinating knife. The original sheath is missing and leaves me wondering what it looked like. I would assume it was a low profile for covert carry. This knife makes a standard First Pattern look obese. If he saw it, what do you suppose WE Fairbairn thought of this knife? It is a far cry from a Shanghai Dagger and is more reminiscent of an Italian Stiletto. Below: In this photo you can see the similarity in the blades. Were they ground by the same deft hand? Someone at Wilkinson having great skill produced these two very rare knives. I am blessed to be the current owner of them and it is my pleasure to share them with you. More of the story about the bottom knife can be found under the "Rarest of Them All" page. Below: This is one of the rare knives we sold for a friend on this website. It is a stunning example of a First Pattern with three inch guard. The buyer is very happy to be adding it to his collection. Wilkinson did a wonderful job constructing these knives and they are a testament to the expertise of the British Cutlery trade. Below: Our two original First Patterns with three inch guards. 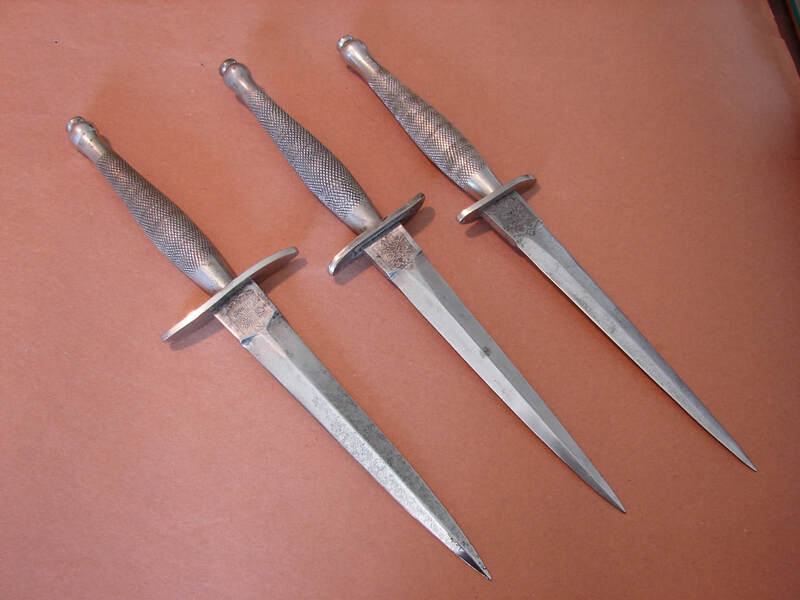 Supposedly the First Pattern knives with three-inch guards were the first ones produced, numbering fifty or less. (Now we have documentation that more were made as part of the first 500, First Pattern Knives.) I have a story that goes with this knife. 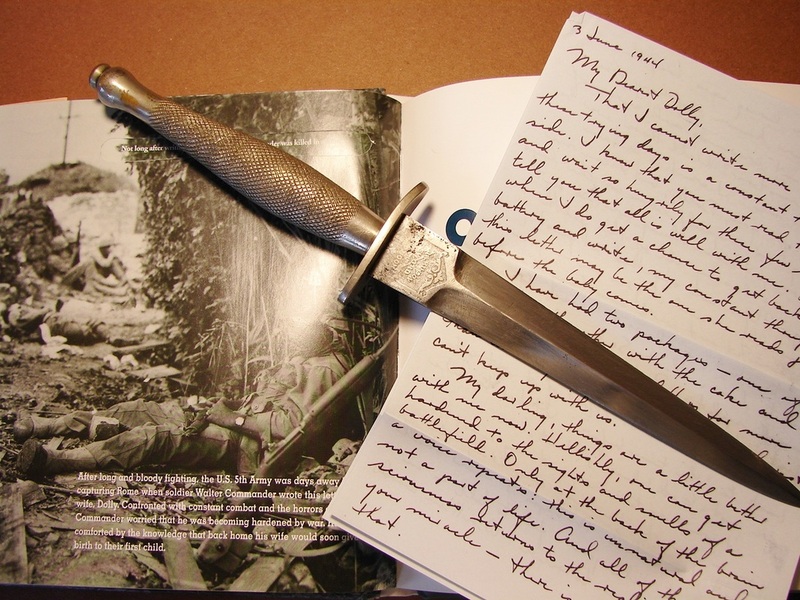 You can find a photo of this same knife on page 99 of Homer Brett's missive "The Military Knife and Bayonet". I bought the knife from Homer on the installment plan. Years ago I met a seller of F~S knives at a gun show in Pennsylvania. I mentioned I had a 3" guard P-1 and he asked me if the sheath had a big dent in the chape. I confirmed that it did. He told me that he bought the knife from the original owner and later sold it to Mr. Brett. 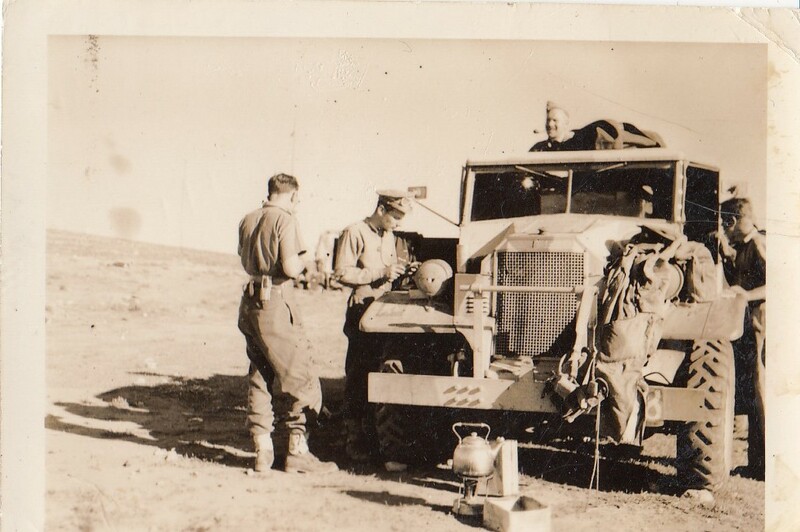 He recounted that the original owner was a Sergeant John Foulis who served in North Africa in a Black Watch regiment. Ironically, Sgt. Foulis was living in a retirement home in Florida at the time of the dealer purchasing it. Below: A treasure worthy of a king's ransom! All original WW-II Wilkinson Sword Co. First Patterns. I have since purchased one or two more not shown in this photo. A good friend told me he does not have a single "collector's bone" in his body. I guess I got all of them. Below: Of all of the Fairbairns I own, this one with the three inch guard is still the finest handling knife of the bunch. Due to its rapidly tapering blade, the balance is exactly as William Fairbairn described it should be. He said that the knife should handle like a surgeon's scalpel and this one does. A close-up of the three inch guard and the nearly indistinguishable Wilkinson Sword Logo. Shallow etching like this is fairly common. 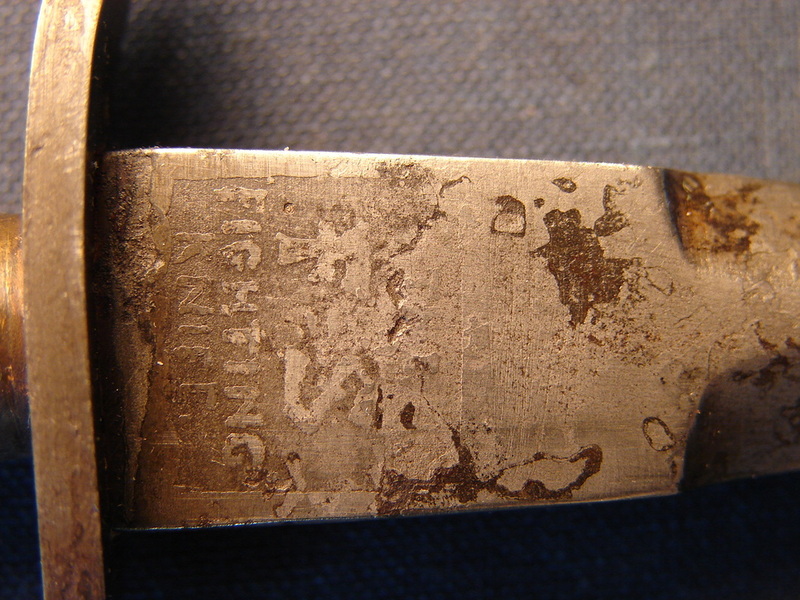 Deep etching sometimes is an indicator of a counterfeit or reproduction knife but remember these were all handmade and hand etched so they all differ. 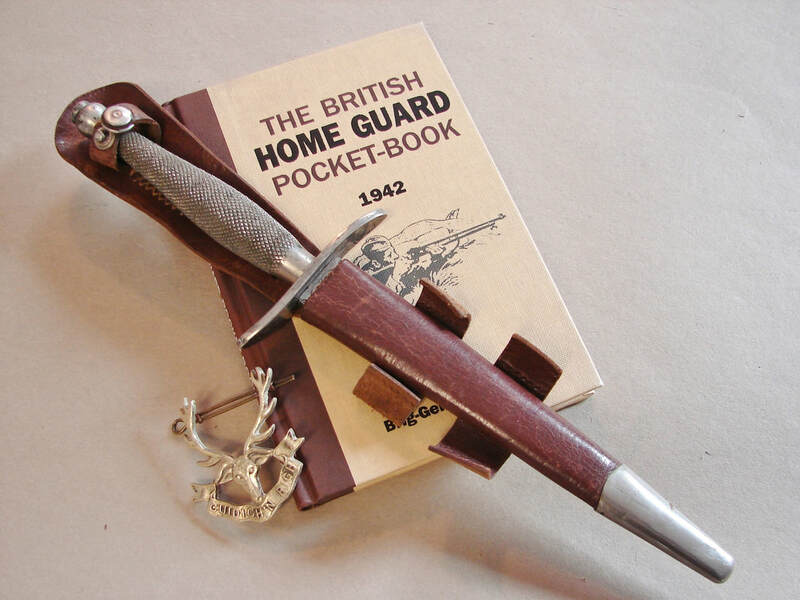 News Flash: A new book written by Ron Flook provides documentation proving that the three inch guard knives were, in fact, produced by Wilkinson Sword. This is not news to us since we had previously been given a copy of a letter written on Wilkinson Stationary stating that: "as far as we know about 500 of the first edition with the three inch crosspiece were made." The letter was signed by R.G. Button, Sales Administration Manager, Wilkinson Sword Co. London England. This letter was dismissed by some experts. 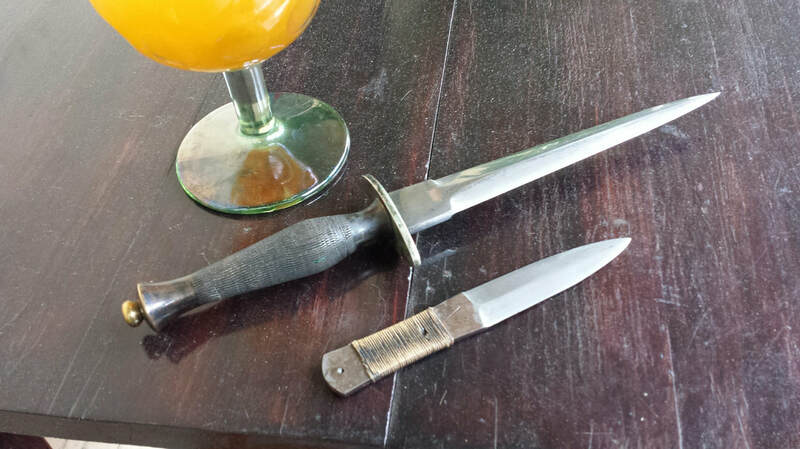 Below: Another good friend and collector sent us photos of two first pattern style knives which he said had the guards crudely cut down from three to two and a half inches and left with rough file marks on the ends of the guards. 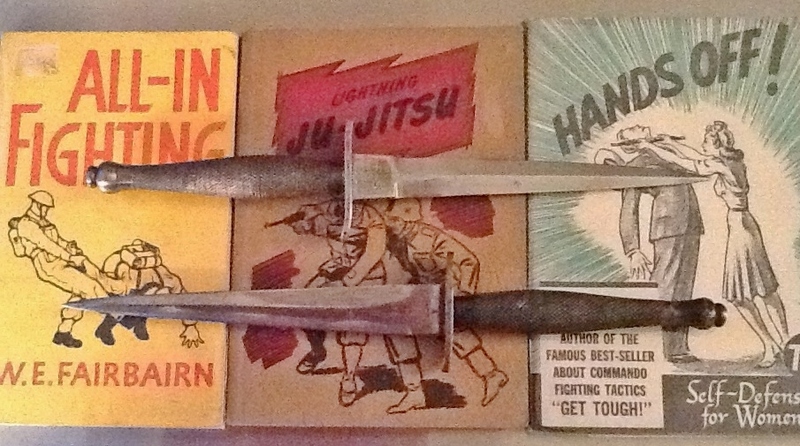 The image is a little grainy but these are the knives. Maybe the "experts" will explain to me the rationale of counterfeiters making a "Fake" knife with three inch guard and then cutting it back to two and a half inches? The top one is a Wilkinson, the lower one made from a bayonet. UPDATE: I now own the Wilkinson and it is the middle knife in the photo at the top of the page. Below: this is the same knife as the top one in the above photo. The three inch guard was cut down to 2 1/4 inches in the field and coarsely rounded on the ends. Below: Another three inch First Pattern: We have been consistently told by some people that the Wilkinson First Pattern knives with three inch guards are 99% all fakes. It has become so often repeated as to assume the mantle of unquestionable truth. Shown here is another First Pattern knife with three inch guard and an accompanying letter of its authenticity. Yes I realize the letter could be forged, the knife could be a counterfeit, and the earth may be flat. Humor me and just enjoy the knife. 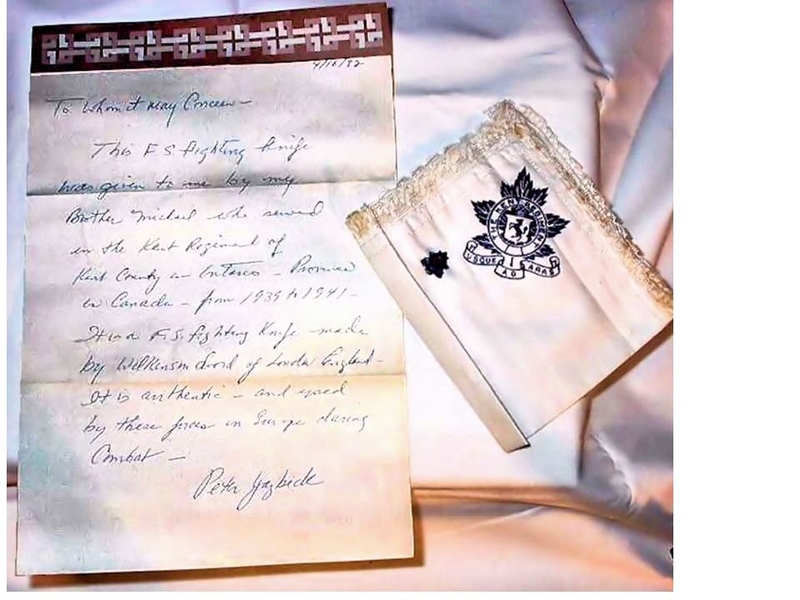 Note that the brother (writer of the letter) does not make any comment about the rarity or possible fakery of the three inch guard because it was simply a F.S. 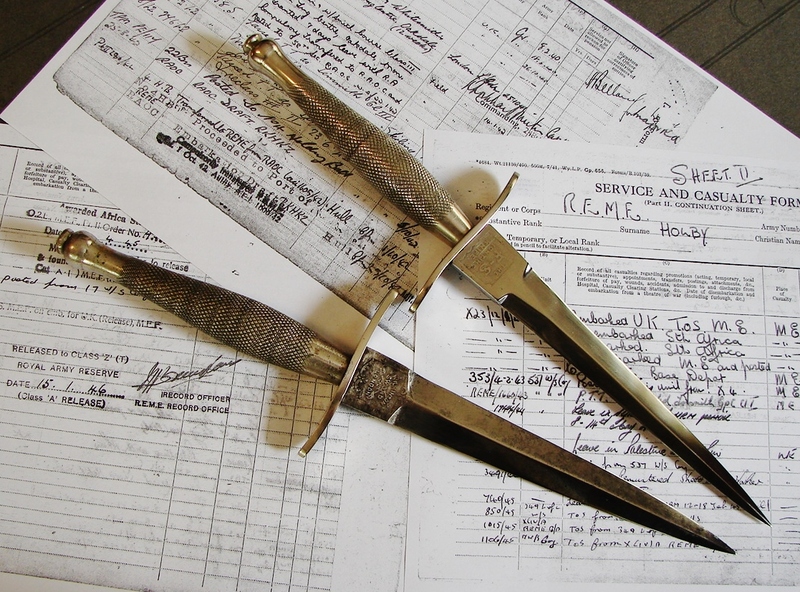 Fighting Knife and special in its own right being made by Wilkinson Sword of London. He was not trying to hype it as some uber-rare knife based on the guard. 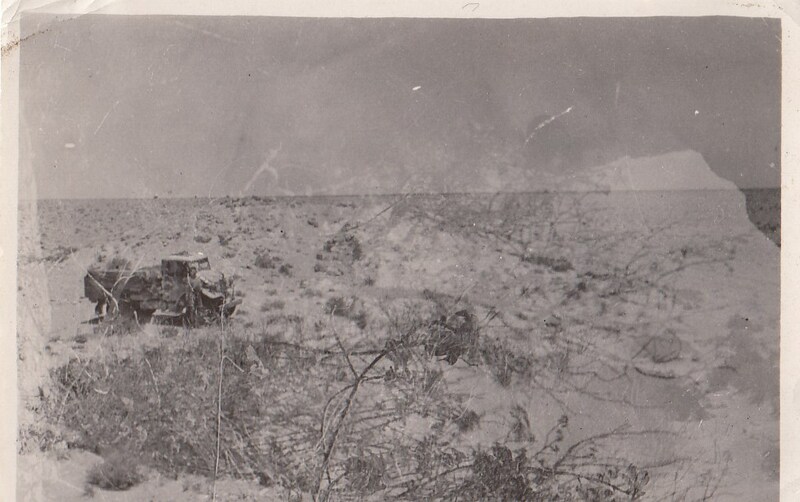 Below: The next two photos have been loaned by a collector who wishes to remain anonymous. 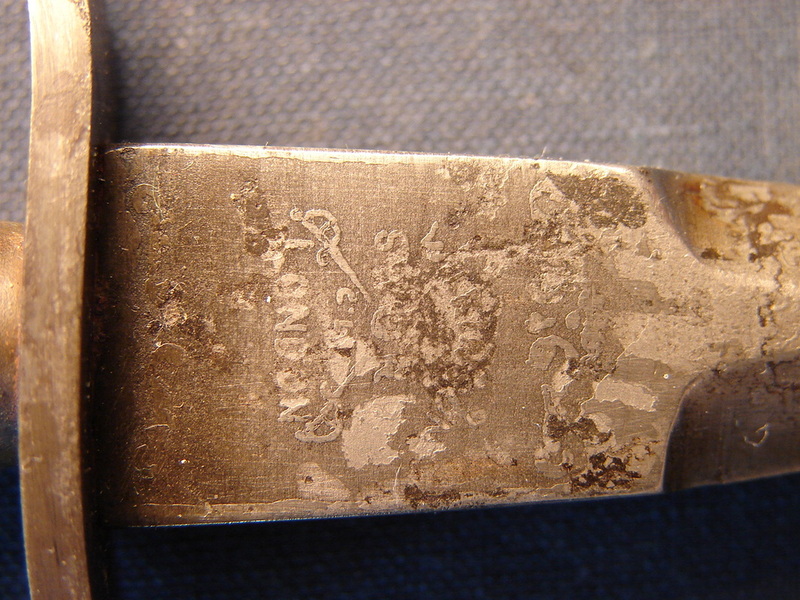 Two images of a fine First Pattern knife with the Wilkinson logo either missing or so faded it does not show in the photo's glare. Below: How many examples do we need to provide until some people are finally convinced that these knives were an early production item? This is another fine example with clear Wilkinson etches. The image was provided by a new friend who wishes to remain anonymous. 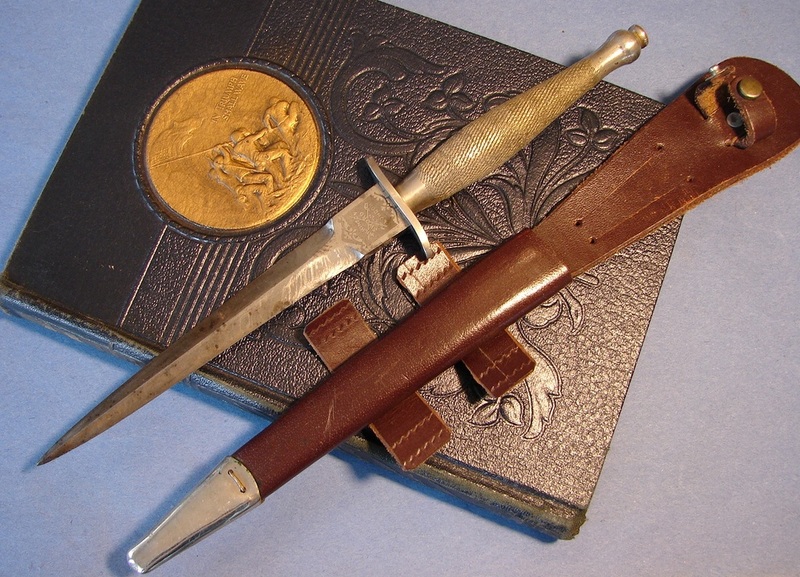 He has an extraordinary collection of Fairbairn Sykes, WSC marked, and X-dagger style knives. We are grateful for him sharing images of his knives with us. numerous small companies that do nothing but leatherwork. Mathew Harvey Co. in Walsall specialized in making holsters." 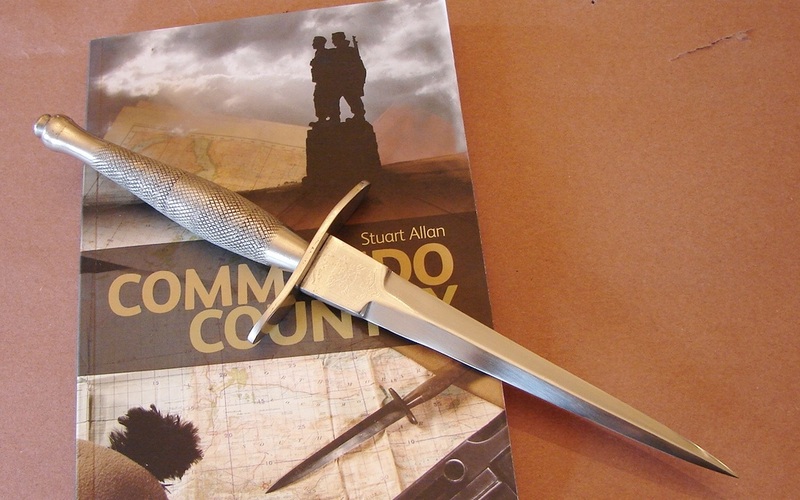 Below: Achnacarry Dagger: Here is a photo of the knife previously known as an Achnacarry dagger with the Agent's-size dagger made from a broken First Pattern Wilkinson Sword Fighting knife with an old copy of the book "Cloak and Dagger." 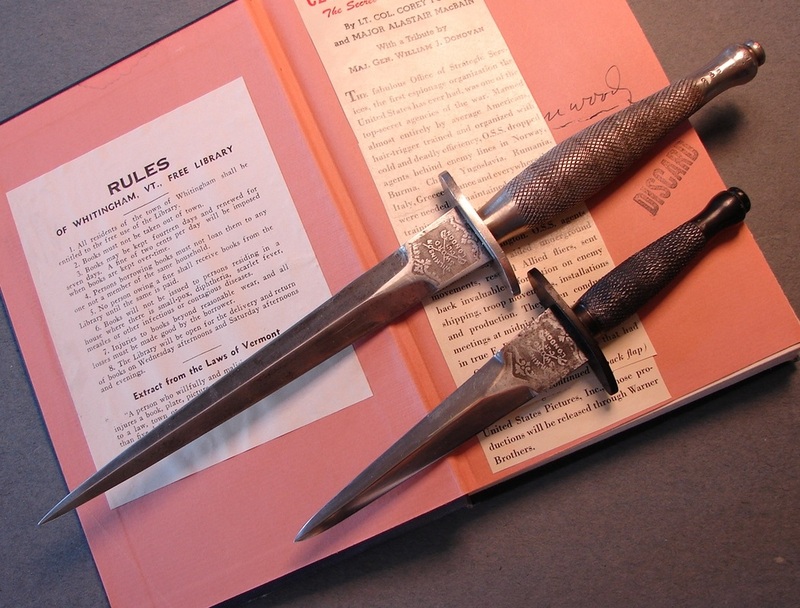 (Based on new research by Paul MacDonald we now attribute these numbered knives to the training center at Inverailort.) With this knife I have finally acquired one of the rarest of First Pattern Wilkinsons. The knife illustrated below is one of a small number which are thought to have been delivered to inverailort strictly for training purposes. The story has it that an order, numbering perhaps as many as 500, was shipped there for the use of the men during training. 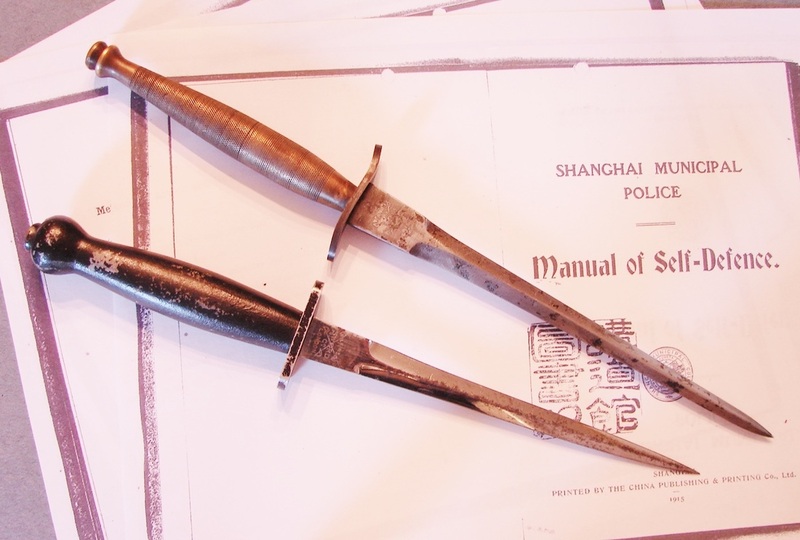 Each knife was stamped with two numbers, a "stores" number, and an individual serial number. Furthermore the story says that each recruit was issued a First Pattern and the serial number recorded. Upon his graduation he was supposed to return the knife. In exchange he was given a chit that could be offered up at the Wilkinson shop and receive a new F~S knife. A list of known, numbered knives that have shown up in private collections accounts for less than thirty of the Inverailort knives. A New Twist: The following hypothesis is offered up by Paul MacDonald, of MacDonald Armouries, Edinburgh, Scotland. I concur with his reasoning based on the dates of training and the manufacture of the First Pattern Knives. See what you think. "The suggestion put forward to date is that 30946 was an Achnacarry stores number. Further to some recent findings and thoughts, I am of the belief that it was a stores number for Inverailort House. 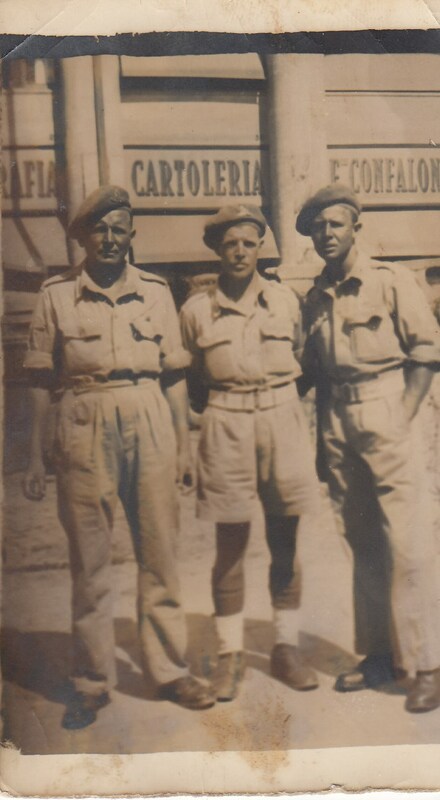 My reasoning is that Inverailort was an Army STC from May 1940 until August 1942, the original Commando training centre. Achnacarry House and Estate took over the role as CBTC from February 1942 due to it's greater size to accommodate greater intakes. 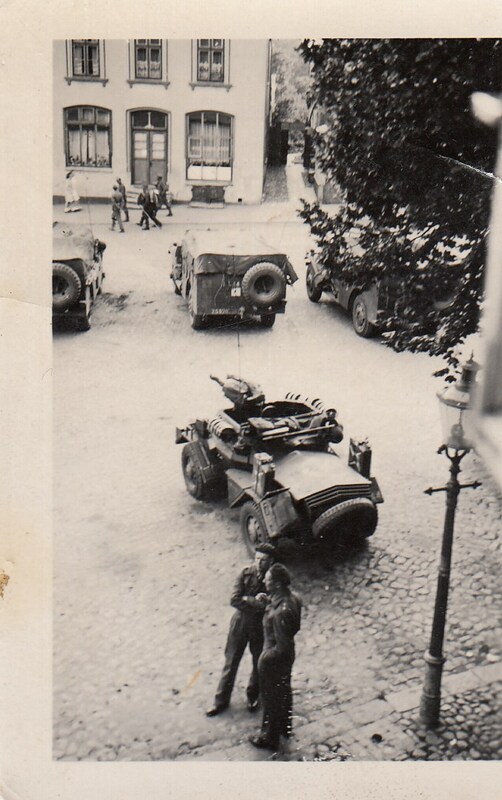 The 1st patt's as we know were manufactured from Nov 1940 to April 1941. Without doubt, some first batches were sent to Inverailort as that is where F&S taught. They never instructed for any time at Achnacarry, that role was headed there by Stan "Sonny" Bissel. 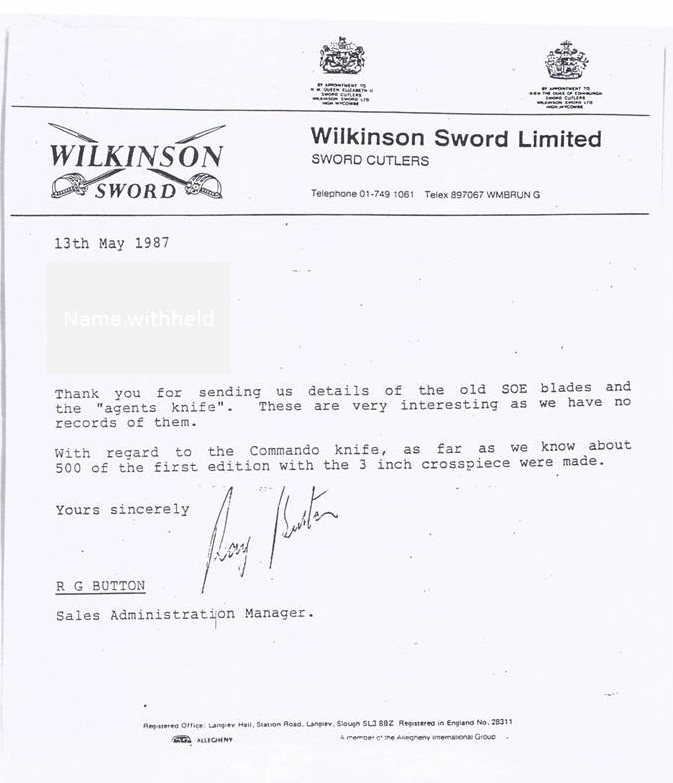 Any new batches of Wilkinson knives ordered specifically for Achnacarry as CBTC would have been 2nd pattern at earliest. The suggestion to date is also that numbered knives were training knives. Given the fact that many of the numbered examples bear active service provenance, could the number relate to not a store of training equipment but for issue equipment from STC upon completion of training?" This last statement might also explain why our "Achnacarry/Inverailort" dagger is numbered, but ended up in the service of A.H. Pechell. Below: You will note there are many unusual cuts on both sides of the ricasso. I cannot explain them. They appear to have been inflicted after the knife was etched but I do not know what might have caused them. The narrow blade has a lovely long taper, and a slight wave about 1/2 inch from the tip. Shown above is the Stores number 30946 which is common to all of the known Achnacarry knives. Obviously it was stamped into the handle after it was assembled, one number at a time. Written in ink on the back side of the frog is what I assume is the name of one of the knife's owners. We have been given permission to post some of the veteran/owner's story under the "Stories" section. Above: Just another nice First Pattern. 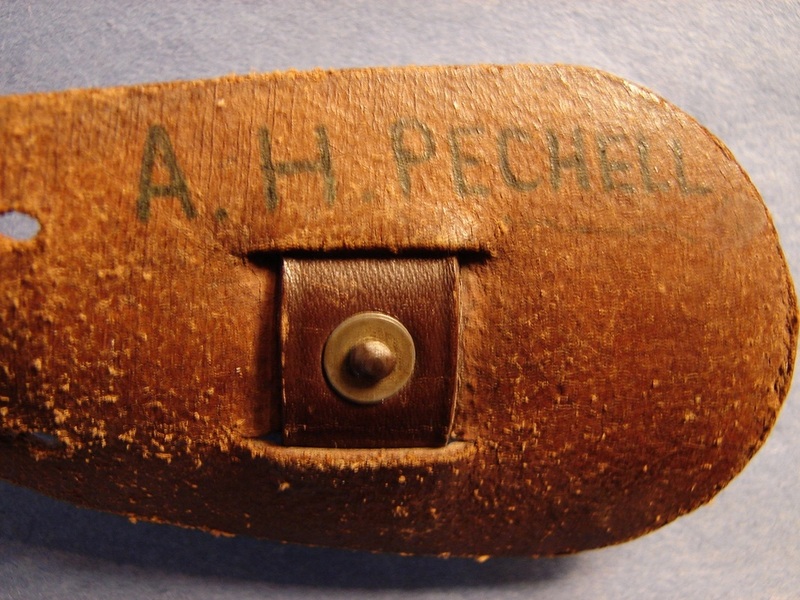 Below: A nice original P-1 with a very unusual sheath. Some collectors think these sheaths were made in the USA but this one came with this First Pattern. They are not as nicely made as the standard sheaths. 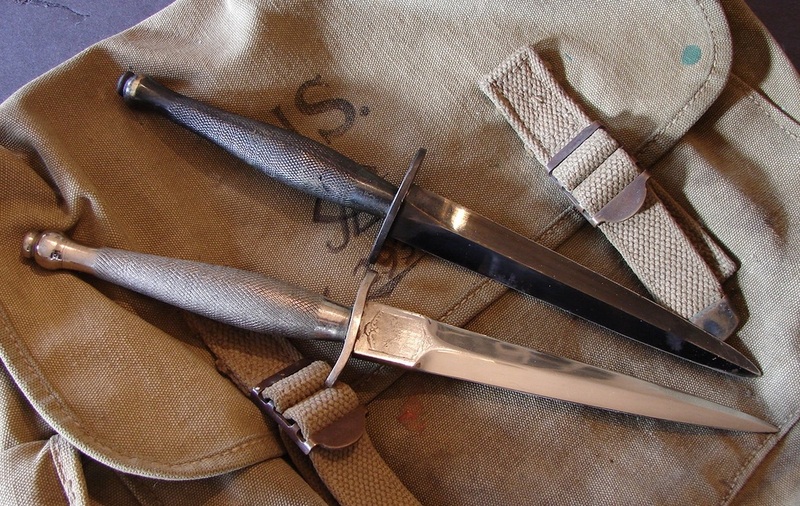 A couple more nice WW-II P-1 knives from our collection. Below: The blade of this First Pattern was enough different that for awhile I was concerned it was a fake or a postwar reissue. The blade is stouter/fuller than the others, and exhibited a mirror perfect finish. It also looked like it had been plated but upon closer examination I realized the line across the blade just below the guard was not where some plating stops, but where the sheath stopped. This caused some staining over the years. The guard itself is a little thicker and is non-ferrous (brass?) plated with nickle. It is in the best condition of all of my First Patterns but it does not have the same feel in the hand due to the heavier blade ruining the balance. The sheath is also mint condition leading me to assume the whole package was bought new and stuck away in a trunk or seabag. The blade, like many of them, has never been sharpened although it comes to a very near edge. 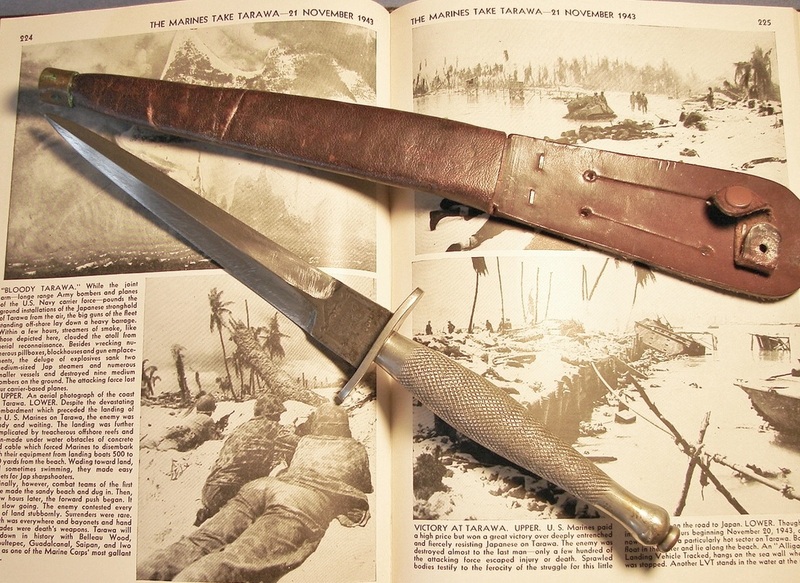 No other combat knife has the same foil-like feel in the hand that a P-1 Fairbairn~Sykes has. You have to hold one to appreciate it. The second pattern knife in the photo is also near mint with the exception that some of the tip is missing. It too has a very good feel and balance, possessing a very thick blade. While I have waxed eloquent about the First Pattern knives I ought to admit they were not perfect. You will find some with wavy median ridges from either the grinding or the forging process. Some of the tips are not quite on center either. A four bevel dagger blade is one of the hardest to manufacture even in the best of times, no less when people are flying over your city dropping bombs on your heads. One other thing you might find with some blades is that the median ridge, part way down the blade, is actually thicker than the ricasso, sometimes noticeably so. OK so they were not perfect. Below: The photo speaks for itself. These are the cream of the Fairbairn~Sykes genre'. The Center one being the 3 inch guard version. 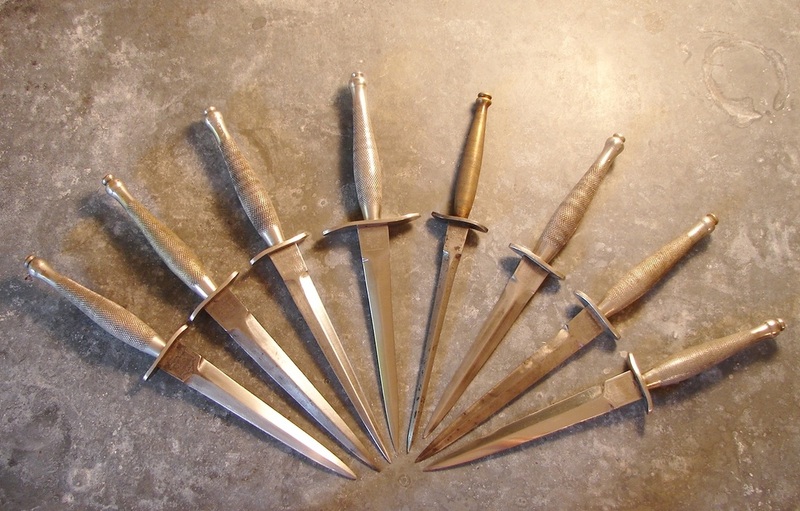 This grouping gives you an opportunity to see the slight variation from blade to blade, in taper and length, bearing in mind they were all hand ground.